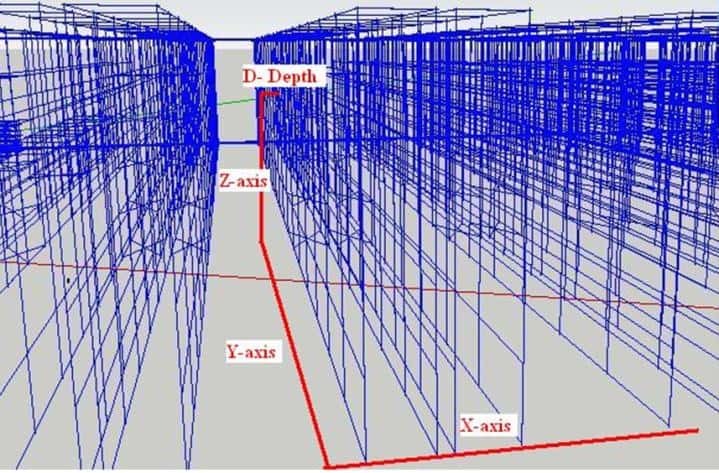 Using the actual dimensions of the warehouse, the software first plots the warehouse out using lines. The dimensions are in 3D and have an X, Y and Z dimension to build the 3 dimensions. 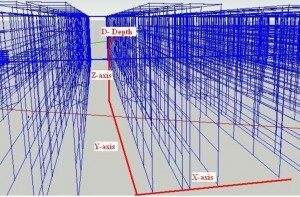 In addition to this, the software also allows for a D dimension to input multiple pallets deep. Once the warehouse and its product is dimensioned, the travel path of the lift trucks are plotted in. Now an analysis can be made on the travel time in the warehouse. And once the detail of the rack is in the software, the warehouse manager can go for a walk in the warehouse with the software mirroring his movement through the warehouse. The detail of the storage slot, the location and the aisles are all represented in the software. The software can pull data from the WMS server and update the 3D image with currently inventory levels. By pulling against historical data, product movement (velocity) can be shown. In this image, products shown in red are fast movers. SKUs shown in blue are medium movers. And items shown in yellow are the slow movers. 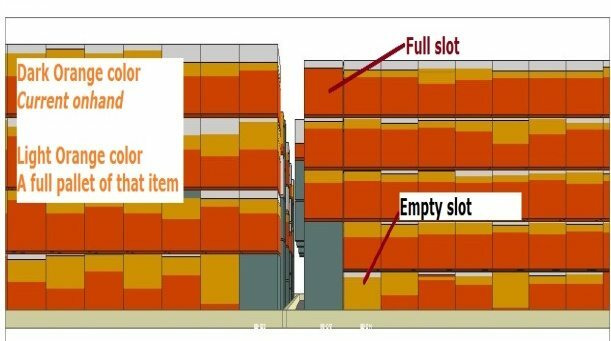 With this information at hand, a warehouse manager or lift truck operator can immediately identify which items are located in the right storage slots, and which pallets should be re-slotted. 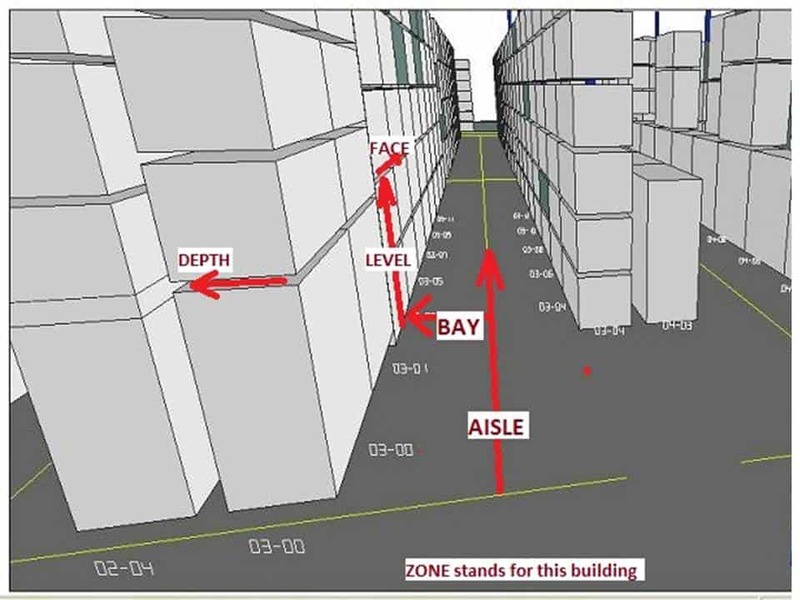 In this image, it might make sense to expect to see all the fastest moving products located at the end of the aisles, at ground level and identified in red. As you can see, some slow moving items are not in their ideal storage slot based on velocity. Imagine pouring over excel spreadsheets and how time consuming it is trying to identify fast moving SKUs for re-slotting. This screen shows clearly which products are moving the fastest. This representation show the multi-level storage bay with the number of hits represented by color. Laying out a warehouse has never been easier with this warehouse software tool. And what about the warehouse forklift operator who drives around wasting time looking for an empty storage slot? This screen shows the empty slots at a glance. Now an material handler can roam the warehouse with an ipad and this software running identifying which pallets to consolodate or move to more space efficient storage slots. For a video the capabilities of this warehouse visualization software click this YouTube link .